I ended up loving this spread. 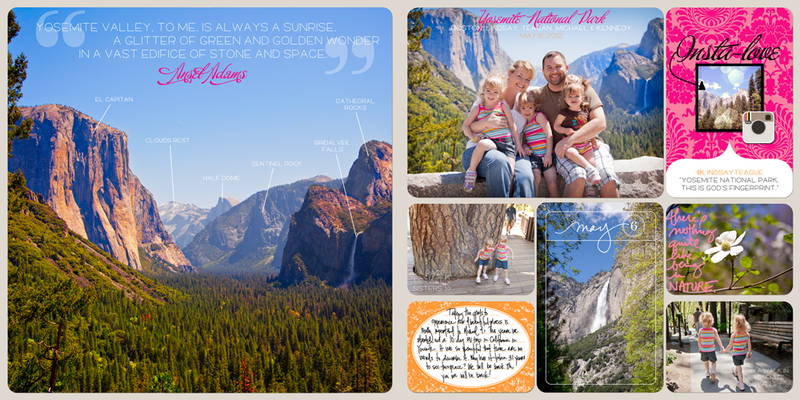 I started to put that large Yosemite photo into a small picture slot and then I just couldn’t leave it there. I had to go full-page on it. It’s just too amazing to fit into a small space! I love this place. We had an amazing family trip here and M and I already want to go back (when the girls are a little bit bigger and can go hiking with us). More vacation photos to come! I absolutely love the pages that you’ve created for your Project Life photo albums. May I ask what fonts you have used for these two pages (the two fonts on the left page and the font that is used for ‘may’ on the right page)? I have used the traditional Project Life kits until now but I’m switching to digital and I would love to use these fonts.